This year I'm on a mission to inject more colour into my life both on my face and in my wardrobe. So when I made my usual trip into Superdrug to look around I avoided my beloved nudes and hunted out something that took me out of my comfort zone. This blush palette is something else, it's three very vivid and elaborate shades of pink that I normally would never go near. 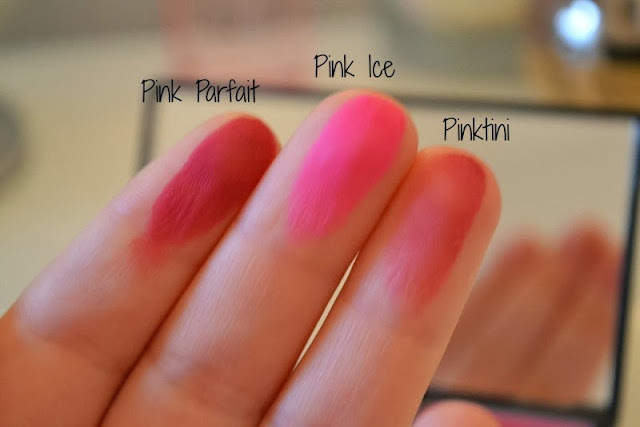 Before I get down to describing each shade individually I must say these blushes need to be applied with a very light hand to avoid looking like a dolly! Pink Parfait - This blush is the deepest of the shades, with a plum undertone to it. I would say it's probably the hardest to blend out of the three and needs the lightest of hands to apply. I'm not a huge fan of this shade but it could look nice with the right look. Pink Ice - Out of the three it was this one that I was most cautious of, I mean look at that colour it's extremely pink and reminds me of Barbie. To my surprise this is actually my favourite of the three, it looks so beautiful on and is really very different to any blush shade that I've worn before. Pinktini - This also has a slight undertone but isn't as dark as Pink Parfait so it's much easier to blend into the cheeks. I love this colour, it's not as pigmented as the other two so it's much easier to wear. Overall, I'm really glad I brought this palette as just looking at it it's so beautiful! Although it is a rather bright palette don't be put off by the vividness of these colours, they're really not that scary! Sleek's Blush By 3 palettes retail at £9.99 each which I would say is quite reasonable for three blushes. I already own the 'Lace' blush trio which is also gorgeous so if your more of an orange toned blush kinda girl or aren't feeling too adventurous check that one out instead as its lovely! I think I'm going to give in and buy the pumpkin trio also because I can't get enough of Sleek's blushes! This palette looks so pretty and I love sleek blushes!